It’s time to get back to my first love at Melodysoup and Melodysoup LOVES books!These book lists are intended as a resource as you seek to stock your music classroom library. Share the link to a list you like with your librarian or principal. Or print one out and put it in your purse so you’ll have it the next time you are at a book store. Include one of the lists in your yearly supply request, or give a copy of the list to your PTA. 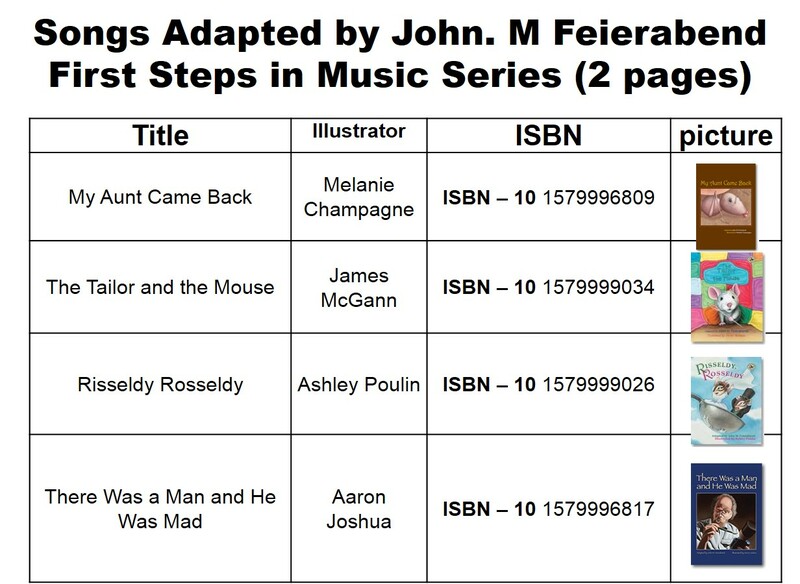 On the Book List for Music Teachers Page you can either download the PDF, OR if you are looking for an individual title, you can click on the picture and it will take you directly to the book of your choice on Amazon.com. I haven’t had as much time as I would like to study the methods he has developed, so I am in no way claiming to be an expert in his work. However, I have attended a couple of quick classes at TMEA and I have been able to incorporate several of his children’s books into my teaching because they are grounded in American folk music. As it turns out several of the songs that he has created books for are songs that are part of the song collection we use as part of Education Through Music called Let’s Do it Again! . In fact, one of the things that I like best about Feierabend and my understanding of his methods is that they seem to be in line with what I have been studying for years with the Richards Institute.He is probably most well know for his development of his various music curriculums including First Steps in Music for Infants and Toddlers, First Steps in Music for Preschool and Beyond and Conversational Solfege. The books that I am listing today were developed by him as part of his First Steps in Music curriculum. I own a few of these titles and use them regularly. However, this book list is one of which several of the titles are still on my wish list. You may find that there are books on this list that you are unfamiliar with, but that isn’t a problem because each book has a link to a digital recording that can be found online for your reference. My hubby is a music teacher. I'll forward this post to him. He runs a brass band program for elementary students. Wonder if these would have been helpful in my early years of homeschooling. They sound great! Thanks for coming to visit my blog.